Let's see how many you can remember and name ? Here are a few to add to your list. Jeanery ( I had a Saturday job there about 28 years ago) it was in fargate. Where was Jeanery and what was it like ? Sandersons Stationers on Chapel Walk. I worked there 32 years ago. Whiteheads craft shop next door. My friend worked there and she told me that after making a cup of tea she was instructed to hang the teabag up to dry so it could be reused. Richards on the corner of Chapel Walk, ladies clothes shop. Thanks for the post and welcome to the site ! Ooh - where abouts exactly was the chocolate soldier ? What stands there now ? It was opposite the pub (The York???) on the corner at the top of Glossop Road in Broomhill.... Woodhouse plumbers was next door - I don't know what's there now, I left Sheffield quite a long time ago and haven't ventured into Broomhill for years!!!!! Jeanery was near to Chelsea Girl in Fargate. There were three floors, I worked on the top floor which was just for Levi stuff. Down stairs on the first floor was if I remember right was Wrangler and lee stuff, then there was the basement which had a lot of other stuff, can't remember the details I was only 16 at the time. I can remember that Levis were very expensive at that time (around 1980} well more than I was paid for working 8 hours on a Saturday . But I do remember going to the Whimpy at lunch time, this was also in Fargate it had an upstairs seeting area which was on the same side as Chelsea Girl and Jeanery, at a guess the Whimpey would have been where the Orange Phone shop is now, but that is only a guess, and I have slept since then!!! 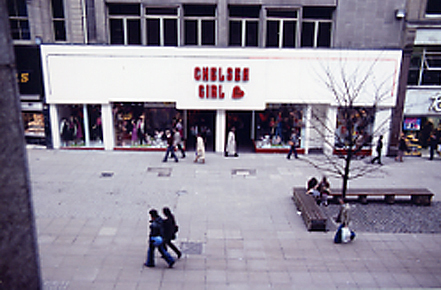 Here's Chelsea Girl taken from the window of Marks & Spencer in 1980. Bradley's Records was my main target whenever I went into Sheffield. What a pity to see only the shell of the building remaining after many months of inconvenience. I usually went downstairs to where the post-Pop generation was catered for. 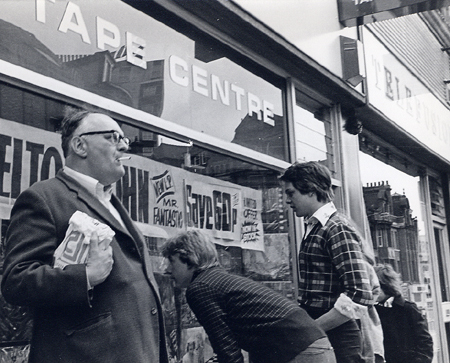 The shop survived into the CD era but this photo dates from 1974. As a newcomer to this web site I have enjoyed myself this morning looking for photos. Here is one of Redgates taken in 1972. What a great addition to Sheffield online. You are a hero/legend to us Mr Wrigley ! 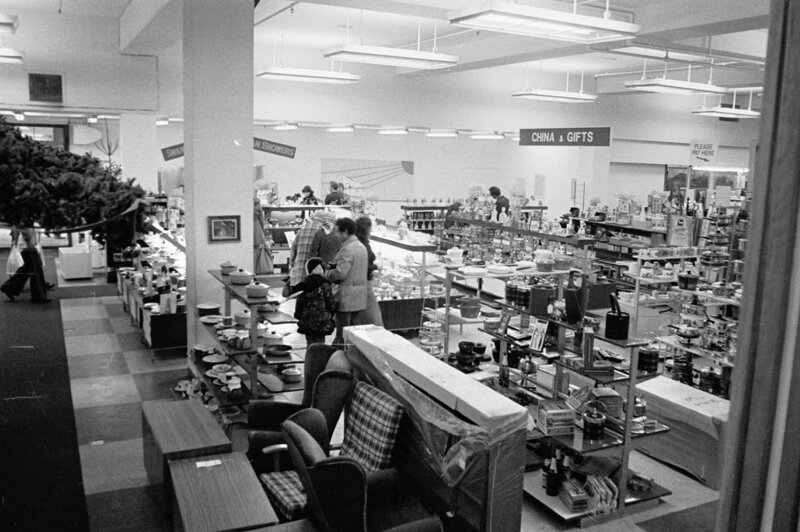 This interior shot of Paulden's was taken in 1976. After decimalisation came in in 1970 or 71 we used to take a shoppers lunch in the cafe for 37p (equivalent to 7 shillings and sixpence in pre-decimal coinage). Wouldn't get you a breadcake these days ! This is the Fargate Davy's building with its more recent tennant. Built for Arthur Davy, the leading Sheffield grocer. Described at the time as the largest provision merchant’s shop in Great Britain, its façade in a restrained late Tudor style is decorated with animal heads, beef cattle, pigs, etc in recognition of Davy’s business which was particularly celebrated for its pork products. 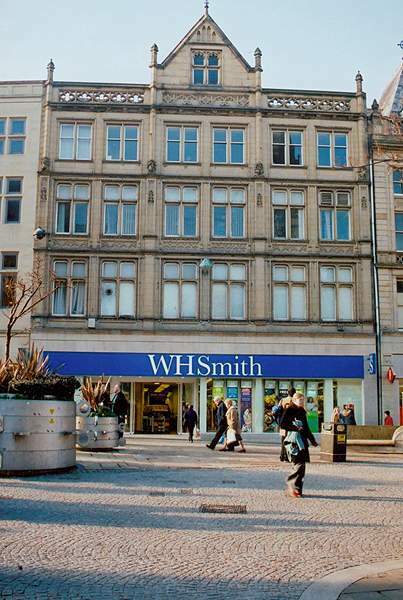 The Co-Op with it's circular stairs and the march up for school clothes. 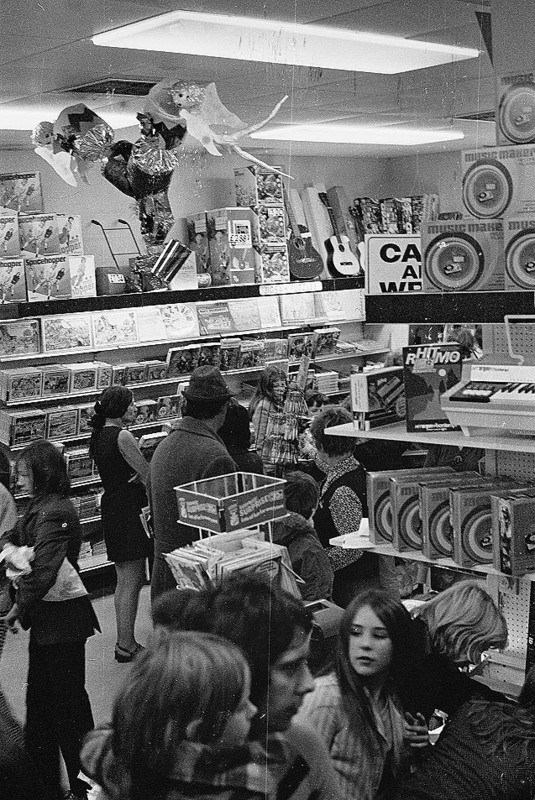 I remember going to the Co op , climbing the spiral staircase for school shoes. I also seem to recall, the lifts had attendants, which used to put me off, as you were not allowded to press the buttons your self. Were attendants good things or a waste of time and money though ? Think they were to stop people messing about in the lifts rather than make the shop look/feel posh. I seem to remember they were not that friendly either.